The first important factor to consider is the garage door cable-repair cost. In most cases, various factors come into play when it comes to repairing the given garage door. For instance, you may have to consider the level of damage that the garage door has as well as the type of garage door that you have installed on your property. How to proceed when the garage door came off the spool? If the garage door came off the spool and it's an electric door, then ensure that you turn off the electrical components and wear safety gloves before proceeding with the evaluation procedure. More so, the garage door pulley system is delicate, and you, therefore, need to understand how this component works to be able to produce the appropriate repair results. How to reattach the garage door cable? If your garage door cable dislocates from its correct position, then you may notice that the door lacks sufficient functionality especially when it comes to lifting the door for accessibility. In most cases, this occurs after extensive usage of the garage door or perhaps as a result of poor installation jobs. For this reason, we at Michiana Garage door repair services can help you with how to reattach the garage door cable such that you can resume your day to day activities as soon as possible. Most garage door system requires adequate care and attention to ensure optimal functionality. On the other hand, when it comes to how to adjust garage door cables, it's important that you are aware that these things are under high tension and it's, therefore, important for you to proceed with utmost caution. In fact, you may need to ensure that the cables are well-positioned on the rails to ensure optimal movement of the garage doors. For those who are not aware, the garage door lifts cable is placed under high tension and is then operated by A special motor that is then used to open or close the garage door. Some of the more contemporary doors can even be operated through the use of individual remotes. Given all these points, when it comes to repairing your garage doors, it's important for you to make perceptive choices for your unique needs each time. In most cases, this may involve calling the closest service provider within your proximity such as Michiana Garage Door Services or perhaps gaining some insight into DIY garage door repair services. ​ The dedicated team at Elkhart Garage Door Services offers a full array of garage door pulley repairs! We have been in the business for a long time and our experience sets us apart from any other company offering similar services. Don't spend time or money trying to determine how to install garage door springs and cables. Call us right away and we will happily get you started on the path to fully functional garage door pulleys. Elkhart Garage Door Services carries a full line of garage door pulley wheels, garage door extension springs, and cables as well. You can even call us when you need a garage door torsion cable. We do repairs on existing garage doors and we also offer full installs! We are the folks to contact when your garage door cables keep coming off. If your garage door cable came off spool we can have it corrected with lightning speed! ​ Recently a customer contacted us about a garage door extension spring cable replacement. Take a look at what this customer had to say about Elkhart Garage Door Services: "The incredible folks at Elkhart Garage Door Services had the entire shop taken care of in less time than the competitors took to call me back. Everything was done so fast and there wasn't a single set back throughout the process." This is the kind of service you should expect from any company that you contract but unfortunately that is the case less and less often these days. We here at Elkhart Garage Door Services promise that if you call us not only for a garage door pulley and cable repair, but any of our premium services, we will do everything possible to make the experience fast and easy for you! If you know anything about how to install garage door springs and cables you know that it is a deceptively difficult and dangerous undertaking. A garage door pulley with cable guide is a great piece of hardware when installed properly. Failure to follow the proper safety protocols or attempting an install with sub-par tools can result in not only an unsightly and inoperable final product, it can result in a terrible accident. This is just one of the many reasons you should not hesitate to contact Elkart Garage Door Services today to schedule your appointment! 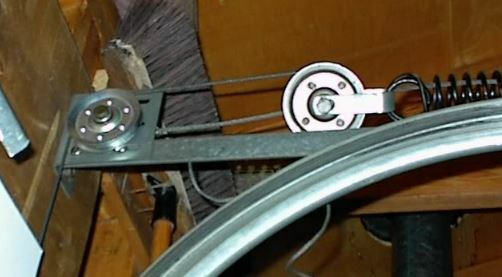 Garage door pulley repair has been a common request from many of our customers for a long time. Sometimes they call with a simple issue like a pulley that squeaks or squeals. Sometimes they call because their garage door cables keep coming off. Sometimes the issue is a bit more severe. We have seen too many times what can happen when a garage door has been either installed improperly, serviced incorrectly, or poorly maintained. Garage door torsion cable breakage is a problem that we face due to these circumstances. Our belief is that you deserve a quality service from honest people at a fair price. We have made a name for ourselves in this business and we pledge to continually satisfy all of our customers needs. Don't wait another moment, pick up the phone and call today! We are waiting to hear from you.